Capriccio showing a curved and ruined colonnade with the remains of a coffered dome supported by six columns above three bays of a barrel-vaulted building with a staricase leading upwards. In the foreground are two figures seated on architectural fragments in a landscape setting. You are here: CollectionsOnline / Capriccio showing a curved and ruined colonnade with the remains of a coffered dome supported by six columns above three bays of a barrel-vaulted building with a staricase leading upwards. In the foreground are two figures seated on architectural fragments in a landscape setting. Pen capricci showing an elevation of a five-bay building with two pedimented pavilion towers; two small plans, possibly of temples. 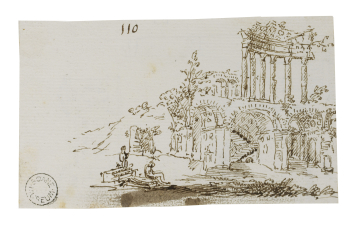 The style and scale of this composition indicate it may be derived from a drawing by Jean-Baptiste Lallemand (1716-1803), such as Adam vol.55/97.